Cook with your heart, but don't forget to cook with a little head too – pig's head, to be exact. While wrestling with a whole head might seem a little alarming, for the fearless cook a pig's head brings with it endless rewards. From crispy pig's ears to the meaty snout and cheeks, a pig's head brings with it a fascinating selection of tastes and textures. 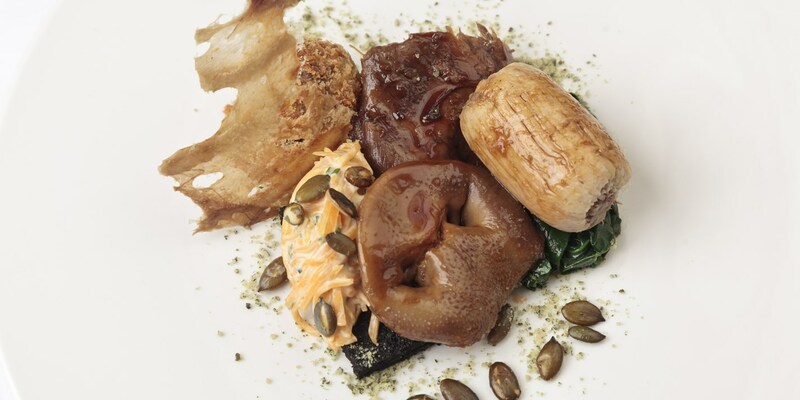 This collection of inspiring offal recipes demonstrate that the pig's head can be transformed into a dish as splendid as one using far more expensive cuts. Try pairing the salty richness of pig's head with delicate seafood, as seen in Phil Carnegie's Langoustines with pig's head beignet, or Tom Kitchin's signature Rolled pig's head and langoustine recipe. Paul Foster works the meat from the head into a delicious silky terrine, while Matt Gillan's autumnal Braised pig's head with black pudding and pumpkin recipe showcases the snout as a striking centrepiece.